Treasures of Montezuma Blitz on the PlayStation Vita is nothing more than a Bejeweled style puzzle game. 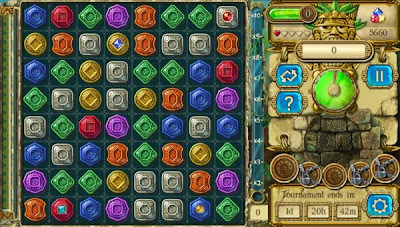 Connecting gems in groups of threes or more to destroy them; generate points from the destroyed gems; the more gems I destroyed in quick succession granted points frenzy which increased the amount I would get for gems destroyed during that five to ten second mode and all this led to a meter filling up to the side. Montezuma Blitz uses the front touchscreen as its only means of input. 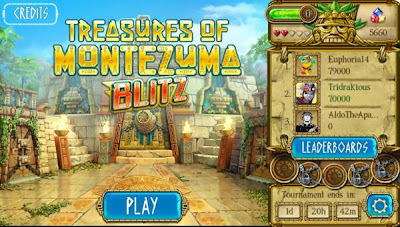 Montezuma promotes short burst gaming, however if I wanted to play more than 5 minutes of the game I had to pay to revive my lives or turn the game off and go back into it. Seems very tedious to me. There are zero trophies to get from this game so if you download it don't expect to rack them up. 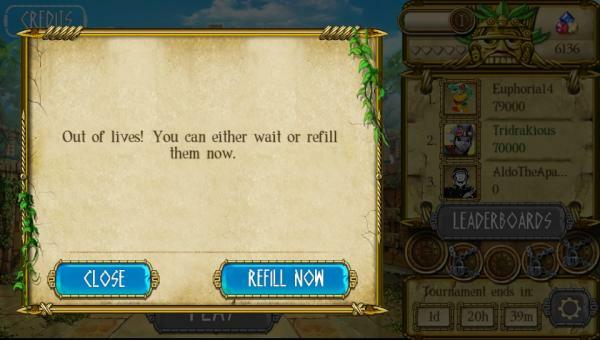 That was the main reason I downloaded Montezuma when it hit the store. That greatly shortens the replayability in my eyes since the game doesn't have much else. There is a leaderboard to see how your high score stacks up with your friends, but with how short the game is I didn't find much of a desire to keep playing once I hit the wall. There is only one level (from what I have witnessed) in the game, however the time allowed is incredibly short and I believe I started with five lives. Once the time runs out in the level I lost a life and once I'm out of lives I have to spend real money to revive those available lives or (as mentioned early) turn the game off and wait for time to slowly recharge them. This strikes a chord with me, because the game is plastered with FREE TO PLAY and FREEMIUM everywhere. I understand that free to play games tend to have micro transactions, but there is absolutely no mention anywhere of that. It seems to be a shady tactic to trick people into playing to play the game. Outside of the shady strategy put forth, this is a very average game. One that I most likely will end up deleting to make room for something a little more respectable. If you don't mind a game dictating when and how long you play then by all means feel “free” to get this game off the PlayStation Store for the PS Vita. Just don't expect to find anything that will actually be worth playing. Once the lives are gone, I was done playing.